British POWs sank with the Lisbon Maru - should it be raised? A Chinese film-maker wants to raise a Japanese ship that was sunk in 1942 with hundreds of British prisoners of war on board. Some of the victims' families back the idea, but one of the survivors says it's a war grave, and should be left where it lies. "We knew we'd been hit by a torpedo. And the ship started listing. That was it," says Dennis Morley, now 98 but then a 22-year-old in the Royal Scots regiment. "It was at that time they battened us down. They meant us to go down with the ship - drown." 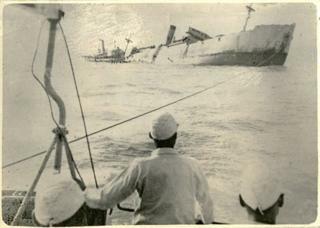 On 1 October 1942, Morley was one of more than 1,800 British prisoners of war being taken from Hong Kong to labour camps in Japan in the hold of a cargo ship, the Lisbon Maru. Conditions were appalling. At the bottom of the hold, Morley remembers being showered by the diarrhoea of sick soldiers above him, "swimming in excreta, virtually". After the ship was torpedoed they were given no food or water - and once the hatches were covered by planks and canvas they sat in the dark, running short of air to breathe. They still assumed they would be taken off the ship before it sank, as the 700 Japanese troops accompanying them had been. But after a day and a night the hull gave a "sudden drunken lurch", as one of the POWs wrote later, and a frantic escape effort began. "Well, one chap, he was in the Middlesex Regiment, he was a butcher and the Japanese allowed him this knife, which he was able to put through the planks. He got through to the canvas and cut the canvas, eventually - the whole lot. The canvas could be lifted out the way and the planks moved which is how we got out," Morley says. "A bit of a panic started because everyone was trying to rush up to this ladder and everybody was fighting to get on this ladder. Consequently, you're getting so far up and falling down into the bottom of this hold - until this officer, Capt Cuthbertson of the Royal Scots, stopped the panic and got them to quieten down. So you could go up that ladder one by one. "Eventually I went up, and by the time I got up the rear end had gone down and it was just the bows. And then… slide off the side, get in the water, lay on your back and float, just make sure you get away from the ship." The first POWs to reach the deck were fired at by a few remaining Japanese guards, but they were quickly overcome. Those, like Morley, that made it into the water were targeted by machine guns on other Japanese ships. However, once Chinese fishermen started coming to the British soldiers' aid, the Japanese also began to gather them up. The most harrowing scene occurred when the ladder broke in one of the three holds containing POWs, leaving dozens of men of the Royal Artillery trapped inside. Survivors reported hearing them singing "It's a long way to Tipperary" as the ship sank. In total 828 POWs died either on board or in the waters nearby, according to Tony Banham, author of The Sinking of the Lisbon Maru, Britain's Forgotten Wartime Tragedy. Especially tragic was the fact that the ship had been sunk by an American submarine, the Grouper, whose crew were completely unaware there were allied POWs on board until they picked up a radio signal several days later, Banham says. At first sight it had looked like any other troop transport ship. Chinese film-maker Fang Li first heard this story four years ago, from a ferry captain in the Zhoushan archipelago, 100 miles (160km) south-east of Shanghai, where the ship went down. He was surprised that he had never heard about it before and started investigating. Two years later he carried out a survey of the area and captured sonar images of a wreck 460ft (140m) long and 140ft (40m)wide, which he is certain is the Lisbon Maru. "While I was doing this I was totally touched by those young boys, the age of my son. So many of them lost their lives there," he says. "One hundred of them are actually still inside the holds, so in every sense you feel you're connected. I was only 30m [100ft, the depth of the wreck] away from those boys who got killed there." News coverage of the discovery prompted family members of the dead to get in touch with him, including Amanda Christian, whose father was seven when his own father died on the Lisbon Maru. The family commemorated Amanda's grandfather with a gravestone, even though his body was far away in the East China Sea. "I would visit the grave often - on poppy days and Christmas, but that's not good enough. He's not there, there's just a stone, there's nothing there," she says. "If you send a man to war, you should bring him home, dead or alive. This is his home." Fang Li has begun shooting a documentary on the subject. He has located a fisherman who helped rescue British soldiers in 1942 and last week he placed an advertisement in The Times, in the hope of tracing more relatives of the British POWs. But he also wants to raise the Lisbon Maru from the seabed, in the hope that it will be possible to return the remains of the dead to their families. For this initiative he has the support of Amanda Christian, but Dennis Morley - thought to be the last survivor still alive in Britain - is opposed. One other survivor, William Beningfield, First Battalion the Middlesex Regiment, now lives in Canada. "Oh God, how many hundred went under? Could be 1,000-odd. I don't know. It's no good getting them out. They're all dead. They are probably bleached bones now," Morley says. "It's wartime and a lot of horrible things happened during the war. They're in peace. Leave them in peace… It is a war grave and should be left as a war grave." Fang Li says he accepts that a sunken warship may be regarded as a sacrosanct war grave - the battleship Arizona, for example, which was sunk by the Japanese in Pearl Harbor a few days before the Lisbon Maru POWs were captured in Hong Kong. But the crew members of the Arizona remain on their own ship, he points out, and in US waters, while the Lisbon Maru, as he puts it, was "a jail". "All those boys were detained there against their will, that's why I feel so sad today - they are still detained on the sea floor," he argues. "In my personal opinion they are on the Chinese sea floor in a Japanese jail. Shouldn't we free them, and send them home?" In 1969, at the height of the Cold War, a homesick, hungover mechanic in the US Air Force stole a plane from his base in East Anglia and set off for Virginia. Nearly two hours later, he disappeared suddenly over the English Channel. What caused the plane to crash? Emma Jane Kirby has been scouring the archives to find out. Read: Was the newlywed mechanic who stole a plane shot down?